How well your hair holds moisture depends on two factors. In order to lock in moisture your hair must first be moisturized. This means the hair must be wet or the product you use must have water listed first on the bottle. Oils or butters used over dry hair will not moisturize it. The oils and butter will only lubricate and soften the hair. For some people it dries it out even faster. 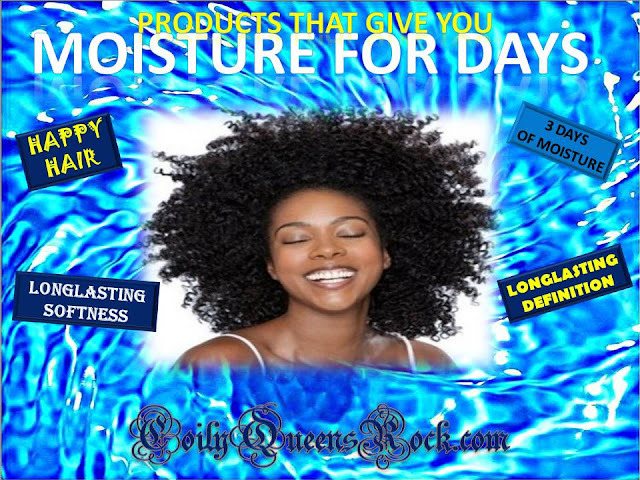 To be sure you have moisturized your hair the best always use a water based product. A successful hair care regimen will keep your hair moisturized for 3 days before it requires more product. At the beginning of your hair journey you might find that you need to apply a moisturizer/leave in product everyday. 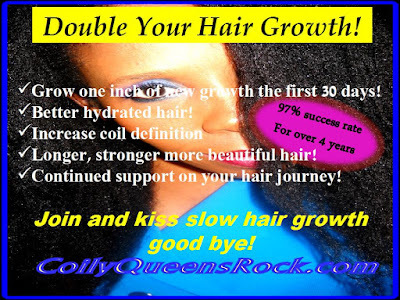 But after 3 years of being natural on a good hair care regimen your hair should retain moisture for 3 or more days. If this is not your case, then re-evaluate your hair care regimen and the moisturizers you use. If you do not have a good hair care regimen, start the CoilyQueens Regimen today. Your hair will thank you. Here are 3 moisturizer products, which gives you moisture for days. FOR DAYS!!!!! This is a rich cream water based product. It will give you good twist definition and fullness. This blend of ingredients allows your hair to stay hydrated for days. This means that you use less product so you get more bang for your bucks. Can find it at Target, CVS and most beauty supply stores. You can always order it from amazon link below. This is a rich moisturizing lotion. No parabens, This product is very thick, white and does not cause build up. Great definition and helps with tangles. This is a glycerin water based moisturizer. It will give you hydration for days. Great definition for your twist outs or wash and goes. It is a light cream product. It works well with other products. Locks moisture into your hair for up to a week. Amazon link below.